Pack size: 3 x 300ml Oxysept Solution, 90 x Oxysept tablets & 1 contact lens case. Review Oxysept 1Step Great product, been using it for years! Oxysept 1 Step provides a simple and effective solution for the cleaning and disinfection of all kinds of soft contact lenses. Produced with the reputable medical precision of AMO, the solution can guarantee a high level of protection against the harmful formation of bacteria and germs on a user's contact lenses. 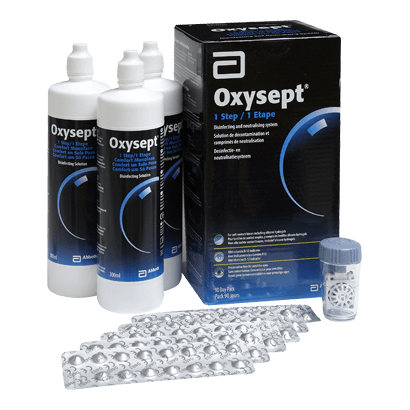 The Oxysept 1 Step solution contains the highly effective benefits of Hydrogen Peroxide. This essential ingredient in the neutralisation of microbes and potential infections is carefully added to the dedicated cleansing formula. The delayed reaction of this neutralising element can offer a greater intensity of cleaning. Superbly easy to use, the Oxysept 1 Step solution can offer all round protection in the most practical of ways. The user simply places their lenses in the provided case and then fills up the container to the required level with the solution adding the neutralising tablet. The Oxysept can then get to work removing any possibility for infection or impurities. Oxysept 1 step contact lens solution arrives in individual 300 ml bottles and 90 tablets. This is sufficient for three months use of dedicated protection and standard usage. The new and improved solution pack contains the solution, tablets and measuring cup. All of these elements can combine to bring a healthy and advanced method of keeping your contact lenses in the best of health.